No doubt buying an excellent keyboard is a great investment. So it is essential to have switches that counter how you expect them to do while offering relaxation for those long game sessions. Mechanical keyboards are one of the most important tools for software engineers and gamers. As a software engineer, I am very picky about keyboards, I log a lot of keystrokes every day, speed and accuracy are the main reason for choosing a mechanical keyboard. One of the greatest strength of mechanical keyboard is the tying feel and sound it provides. Moreover, they have a tendency of more tactile key travel than any other keyboards including membrane keyboards. Do you know how to pick the best mechanical keyboard? There are many different brands of mechanical keyboards in the market, finding the best mechanical keyboard is not easy. This mechanical keyboard buying guide will explain how it works, it also guides you to figure out which keyboard switches are right for your daily usage. You have a basic understanding of Mechanical Keyboards right? Some of the most popular brand of mechanical keyboard switches: Cherry, Gateron, Greetech, IBM, KBT, Matias, Topre. For me, Cherry is the best switch. The differences between the Mechanical Keyboards Switches. Ok, we’ll further explore the differences between the Mechanical Keyboards Switches. Blue switches are the best cherry switch for typing. The tactile bump can easily be felt, and the resistance is similar to your average keyboard. Black switches are considered one of the best switch types for gaming. When gaming, having a tactile bump does absolutely nothing because you're going to be bottoming out anyway. So these give you a very smooth feel. The actuation and release points are at the exact same position as well. So games that require a lot of double tapping become easier than on any other keyswitch. However, most people don't enjoy typing on them that much do in part, to their linear nature. Brown switches are considered a middle ground between typing and 'gaming' switches. They have a light, tactile feel half way through the key press that lets you know the switch has activated. This gives you an indication of what you can release the switch. The switch is considered a middle ground because the reset point & actuation point are close enough together than you can 'float' at that point, enabling you to double tap faster. Red is another switch that can be considered a 'gaming' switch. It's essentially a lighter version of the Black, requiring less force to actuate. Some people do not find this switch that good for typing or gaming because it is so light, but others rave about this fact. Clear switches have often been called "stiffer browns" though some users note that they have more of a tactile feel than browns do. This really can be a subjective topic, though this is another switch that could be considered "balanced." The force required is comparable to most rubber dome keyboards, with a nice tactile feedback to tell you the key has actuated. These switches are harder to find on keyboards. Its alias Cherry MX Speed, by the name you can generally know its attribute. it is the fastest Cherry switch on the market. "Thanks to an actuation point of 1.2 millimeters and the resulting, extremely short travel as well as a low activation force of only 45 cN, this high-precision linear switch is optimized for both low response times and high switching frequencies." From Cherry. Totally speaking, the Cherry MX Speed switch has a smaller actuation than any other MX switch. Above is the most common Cherry MX Switches comparison (not all), we make some more intuitive distinction between all Cherry MX Switches. So far, you should know enough about the differences among Switches. My choice is more little force for long typing or gaming, Clicky for typing and linear for gaming. I really like the clicky sound, however this may affect your gaming experience. If you have a good reason, please let us know. If you want to learn more about top Mechanical Keyboards recommendations, please keep reading. We will review a Mechanical Keyboards per switches. Mechanical keyboards no doubt provides a great level of tactility and also typing comfort that most other keywords fail to offer. Since talking about the feel of keys, then it’s useless if we say that gamers and writers can’t consider it. However, for this hour of need, Das is continuously providing the customers with a great level of comfort for the past many years. Das Keyboard 4 Professional Clicky MX is the latest product with amazing improvements and experience. It is one of the best products that will definitely not going to disappoint the writers. Cherry MX RGB BLUE mechanical key switches (Tactile and Clicky), It operates with an actuation point of 2mm and only requires a pressure of 50g for the key to register a key stroke Furthermore, the actuation point and release point of the switch are identical, which will facilitate speed, precision and more control in typing and less fatigue to your fingers. Built-in 2 high-speed USB 2.0 hub. Added convenience right at your fingertips. Transfer files and photos from your thumb/flash drive at 480 Mbps high speed data transfer rate and 100mA power current on each port. Ideal for small USB mobile devices such as mouse, trackball, trackpad or joystick. 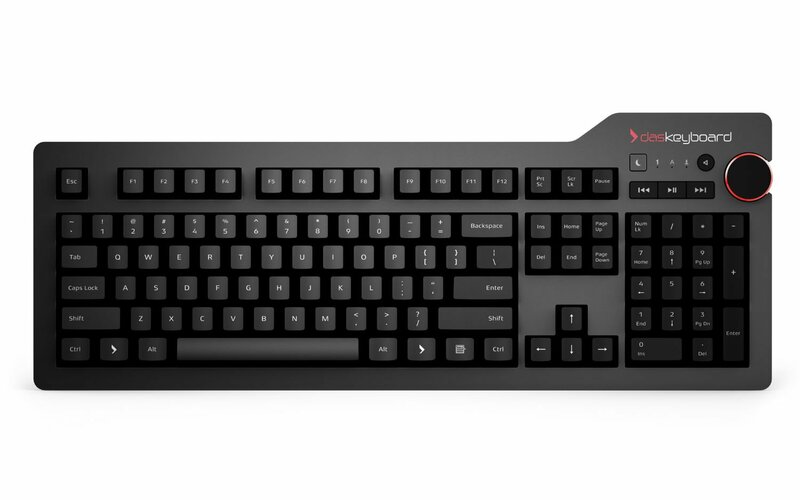 The Das Keyboard 4 Ultimate mechanical keyboard experience is like no other. From the initial idea to every fine detail when crafting this machine, the experience we deliver to customers is what drives our team. The combination of tactile feel, the psycho-acoustic experience and incredible craftsmanship all deliver an unmatched typing experience that only Das Keyboard 4 offers. With a Das Keyboard 4, you'll type faster and longer. It feels so good, you won't want to stop.as Keyboards uses best-in-class, Cherry MX mechanical key switches that provide tactile and audio feedback so accurate it allows you to execute every keystroke with lightning-fast precision. Its high-performance, gold-plated switches provide the best contact and typing experience because, unlike other metals, gold does not rust, increasing the lifespan of the switch. The Das Keyboard 4 Ultimate mechanical keyboard is available in both the Cherry MX Brown and Cherry MX Blue switches. The aluminum body offers comfort and amazing experience of typing comfort to a typist. Offer great buttons tactility and comfort of a key press. It supports N-key rollover (NKRO) which allows typing much faster with losing keystroke. It can be turned off and on. Oversized volume knob makes it's beautiful and provides convenience. Lighter key effect required to push the key down. Works like a keyboard should. The only color is black. For more information about Das Keyboard 4 Professional Clicky MX Blue Mechanical Keyboard，please check out customer reviews on Amazon. Cougar’s style is very much from the Lamborghini, the whole keyboard has lots of chamfers and bevels. The effect is one that you’ll either love or hate. The Cougar 700k offers amazing design, improvement and durability. The mechanical key modules are just mounted on wide-open and bended structure with highly premium brushed surface. Since it's a Mechanical Keyboards for gaming, when we are gaming, we found the macro keys to be well placed for rapid access, although we are skeptical at the split design of the spacebar which has been separated out to add an extra macro key. As standard, both sides of this act as a spacebar but it takes some getting used to when typing. The detachable plastic wrist rest hosts one of the unique features of Cougar 700K, a secondary wrist rest can be magnetically attached to its left side, raising its height by a few more millimeters, making WASD or TAB-1234 gaming more comfortable. Design inspired by “military stealth technology”. Specially developed by PRO gamers who can never miss a single stroke. Sturdy and strong foundation offers durability. Commands can be issued much faster. Split spacebar is great for gaming-Dedicated macro keys. Styling is a personal taste. For more information about Cougar 700K Aluminum Mechanical 32 Bit ARM Keyboard，please check out customer reviews on Amazon. The incredible ROG Claymore offers a luxury experience of a mechanical keyboard. A perfect piece of PC gamers with a lot of functions to perform. It contains Cherry MX mechanical Switches, with a sturdy aluminium body and highly customized RGB lighting to provide your eyes great pleasure. The ROG Claymore comes in two parts: the main board, which acts as a traditional TKL, and then a removable number pad that can be attached to the side of the main board. The Claymore is available as a complete two-part set for about $300, or in the main board for 3/4 price. For actual experience, both parts are very well made, the ROG Claymore looks and feels every bit as expensive as it is. E.g. Constructed from aluminium and tough plastic, and fully customizable RGB lighting. But it's not perfect, although the joining mechanism has been very well designed, but it can not completely avoid the possibility of the number pad loose. Additional, Asus provides a wide choice of key switches, and typing with the Claymore is an excellent experience, with solid keycaps. Maybe the biggest problem for this mechanical keyboards is price. An incredible aluminium solid body. A number of switches to perform actions. Easy to remove numbering pad. For more information about ASUS Mechanical Gaming Keyboard ROG Claymore Cherry MX Brown，please check out customer reviews on Amazon. A wonderful piece of rubber pad shaped which offers you more than millions of keystrokes at a single turn. For design, this is a very common keyboard. However, Cherry Mechanical Keyboard is offering a great pleasure of noise-free experience to all the users out there. The biggest feature of the Mechanical Keyboards is that it's very quiet. It is ideal for use in the office, you do not have to worry about noise. Performance: With Cherry MX Red (Noise-optimized), over 50 million keystrokes per switch without compromising quality, you don't need to worry about it at all. 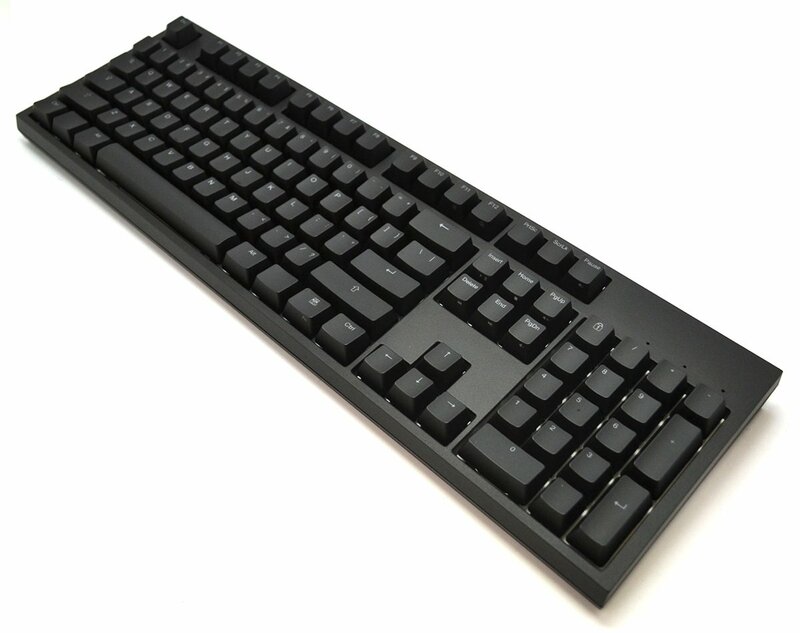 For more information about Cherry G80-3494LWCEU-2 G80-3494 MX Silent Keyboard，please check out customer reviews on Amazon. The beautiful CODE 104-key is designed for timeless. The clean, adorable white backlighting make it more attractive. Now you can see the keyboard even in the dark. Since Cherry MX Clear is not very common switch, the Mechanical Keyboard doesn't have a lot of choices. WASD Keyboards, one of the few companies to offer this switch. It offers both full-sized and ten keyless models. The first obvious feature of the Mechanical Keyboards is its build quality. The Code feels dense and sturdy, with a thick frame and a smudge-proof textured finish. It also happens to be LED-backlit (Full white LED back lighting with 7 levels of brightness adjustment), but only one color, white. For this Mechanical Keyboard, other manufacturers slap their ugly logo, but it has no visible branding on top, no edgy fonts. It’s just a plain blackboard. Very balanced for typing and gaming. Painted Steel Back plate under keys provide even light dispersion. Appealing clean design and smoothness of keys. For more information about CODE 104-Key Illuminated Mechanical Keyboard with White LED Backlighting，please check out customer reviews on Amazon. As the earliest and only brand used the Cherry MX Speed Switches, if you want an Mechanical Keyboard, you do not have many options. 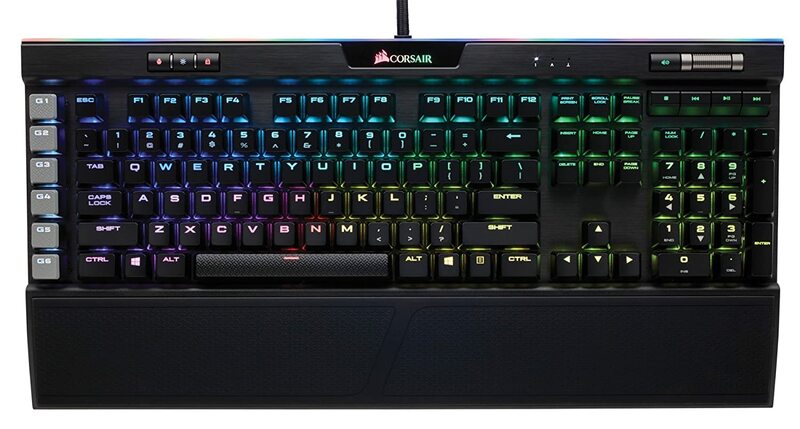 Fortunately, this keyboard is pretty cool, Combine with updated CUE and a nice RGB overhaul, the Corsair K95 Platinum further refines the pinnacle of design and functionality for gaming keyboards that its predecessor, it is now a 100% programmable keyboard with six added programmable G keys. 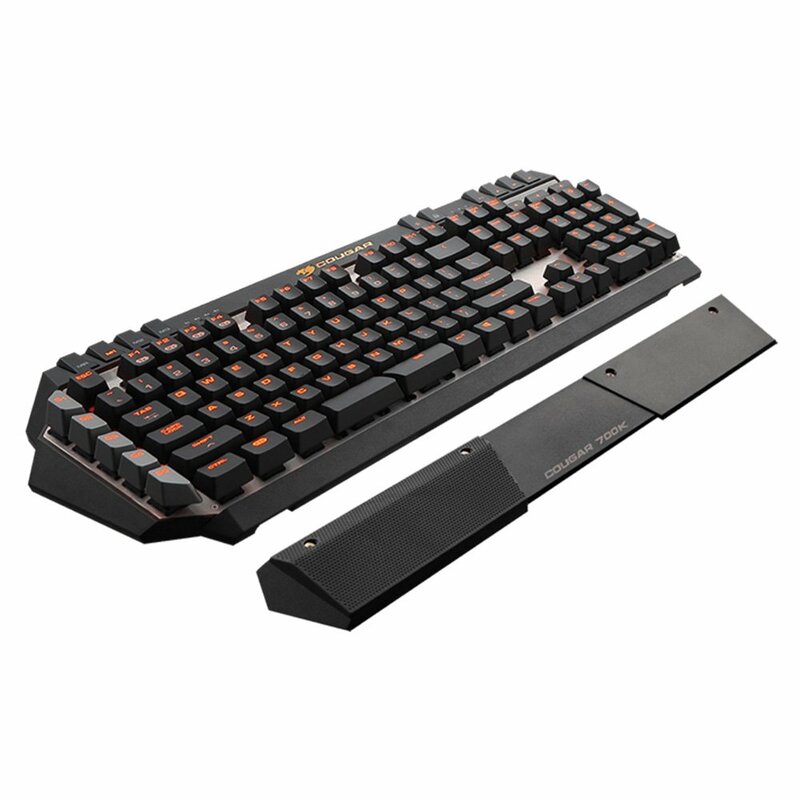 If you log considerable hours either gaming or typing you'll find this keyboard to be premium. It comes in full-sized wrist rest. Provide something extra for gamers. Provides functionality to save three profiles to the keyword which is useful. Handy media and shortcut keys. Good QC of Cherry MX switches. For more information about CORSAIR K95 RGB PLATINUM Mechanical Gaming Keyboard，please check out customer reviews on Amazon. This 6-Key Switch Tester incorporates a steel mounting bracket made from the same material as the steel back plate in our keyboards. This provides a more accurate representation of feel and noise when testing the switches. 6 of each type of our sound dampening O-rings are also included. 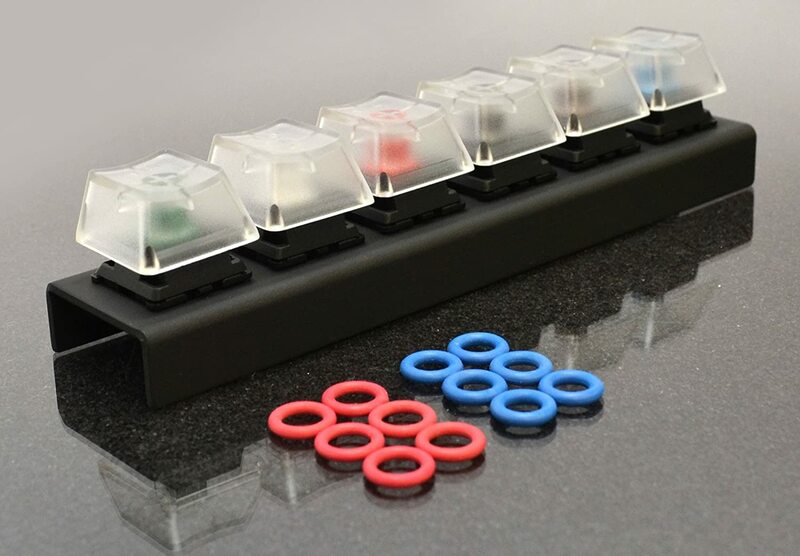 Clear keycaps makes it easily to distinguish which switch and O-rings are being used. Solid construction. The 6 keys are properly affixed and don't wobble. The metal bracket is good too- many mechanical keyboards have metal bases, so it's good to know how the sound can reverberate. Everything is included. Six keys, with clear keycaps so you can see which key is which, and they even included two sets of rubber o-rings that prevent keys from "bottoming out", a popular way to make keys quieter and more gentle on your fingers. Full keys. Nothing was lost, so each key has its contact points intact, meaning they can easily be placed into any keyboard or wired to another project. When you get your mechanical keyboard, you'll have six replacement keys and spacers. How to Choose the Best Mechanical Keyboard? Hundreds of thousands of typing every day not only makes a person exhausted, also the keyboard. One of the biggest benefits of mechanical keyboards is that they’re durable and meant to stand up against heavy use. The keys are rated for dozens of millions of keypresses, which is way above and beyond the standard duty expectation of a membrane keyboard. If you’re the type of person who wants a good keyboard to stick with you for the long haul, or you notice you’re hard on your membrane keyboards, a mechanical could change the way you work. If you’re old enough to remember the IBM Model M keyboard or more recently the Apple Extended Keyboards, you can probably recall how they felt when use, and the sounds they made when you clicked away on them, whether they were your first computers or you used to work on them regularly. Modern mechanical keyboards can bring that sensation back, depending on the switches you buy. Which Mechanical Keyboard suits you the best? In any case, whatever you want from a keyboard, you can find a mechanical keyboard capable of making it a reality—with more heft, longevity, and style than you may have thought possible. Mechanical keyboards are likely to get better as more consumers realize the benefits they offer to laser-focused typists, hard-core gamers, and everyone in between. Depending upon the above-mentioned review on all of the products, in the end, it’s all your choice which one you want to buy. 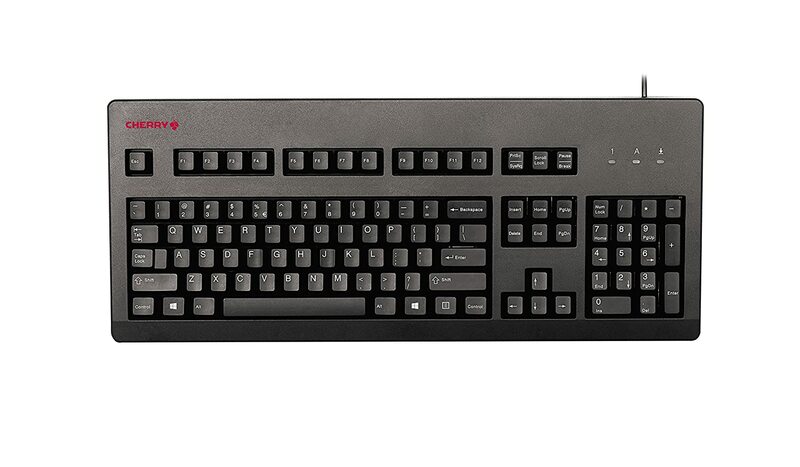 If you prefer the popular brand, USA Filco Ninja Majestouch-2 Mechanical Keyboard (Cherry MX Red) is a good option. If you have a low budget, Cherry G80-3000(Cherry MX Bule) is a better choice. . The pros and cons are in front of you, pick one product that may perfectly compensate your gaming, typing or any kind of typing need.